Q: How do I buy a WoW Token for real money? 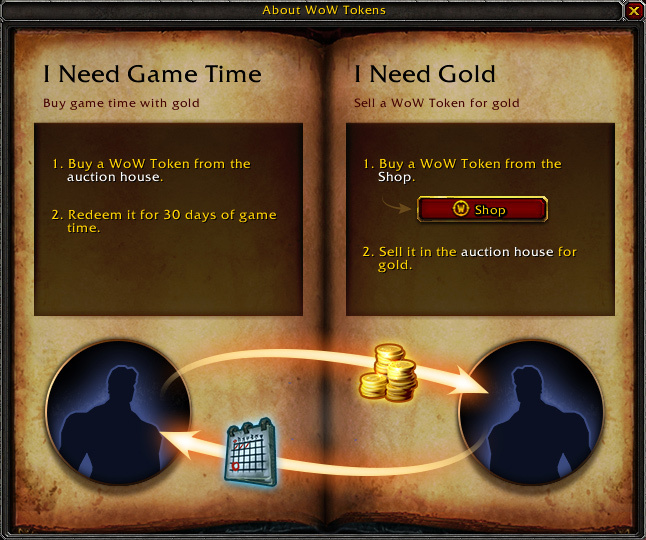 A: WoW Tokens will be available for purchase for real money through the World of Warcraft in-game Shop. You can access the Shop through the row of feature buttons next to your character’s bags. Q: I need gold! How do I sell a WoW Token to another player? A: You’ll be able to sell WoW Tokens through a dedicated Token exchange in the Auction House, located in a new Game Time section. WoW Tokens cannot be traded or sold any other way. Q: I need game time! How do I buy a WoW Token from the Auction House? A: When you visit the Auction House, you’ll be presented with the current market price for a WoW Token in your game region—there’s no bidding involved, and all Tokens in a game region are priced the same at any given moment. If you decide to purchase one, you’ll receive it in your mailbox, and can then immediately redeem it for game time. Q: How much game time do I get by redeeming a WoW Token? A: You’ll receive 30 days of game time when you redeem a WoW Token. Q: Can I resell a WoW Token after I’ve purchased it for gold? A: No, each WoW Token can only be sold once. After you purchase a Token for gold, it becomes Soulbound. At that point, it can only be redeemed for game time. And now I can play til the end of time.